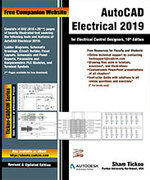 The AutoCAD Electrical 2019 for Electrical Control Designers textbook has been written to assist the engineering students and the practicing designers who are new to AutoCAD Electrical. Using this textbook, the readers can learn the application of basic tools required for creating professional electrical control drawings with the help of AutoCAD Electrical. Keeping in view the varied requirements of the users, this textbook covers a wide range of tools and features such as schematic drawings, Circuit Builder, panel drawings, parametric and nonparametric PLC modules, stand-alone PLC I/O points, ladder diagrams, point-to-point wiring diagrams, report generation, creation of symbols, and so on. This will help the readers to create electrical drawings easily and effectively. Special emphasis has been laid on the introduction of concepts, which have been explained using text and supported with graphical examples. The examples and tutorials used in this book ensure that the users can relate the information provided in this textbook with the practical industry designs. Consists of 13 chapters and 2 projects that are organized in a pedagogical sequence. Comprehensive coverage of AutoCAD Electrical 2019 concepts and techniques. Tutorial approach to explain the concepts of AutoCAD Electrical 2019. More than 45 tutorials and projects.